A drawing in ink depicting Oxford University dress, by S.H. Grimm. Detailed rules governed what members of the university should wear, and it is possible to recognize the degrees held by graduates and the social rank or status of undergraduates by their robes. 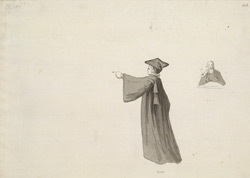 The figure in this drawing represents a Proctor of the university, an elected representative of the Masters of Arts, wearing his official gown. It is of black silk and has wide black velvet sleeves and a folded double pyramid of material (tippet) hanging from the left-hand lower corner of the yoke, to which the pleats of the back and sleeves are gathered. The little sketch in the top right-hand corner shows a figure wearing the Proctor’s special white ermine hood over his gown.